Bütgenbach (French : Butgenbach) is a municipality located in the Belgian province of Liège. On January 1, 2006, Bütgenbach had a total population of 5,574. The total area is 97.31 km² which gives a population density of 57 inhabitants per km². As part of the German-speaking Community of Belgium, the official language in this municipality is German. 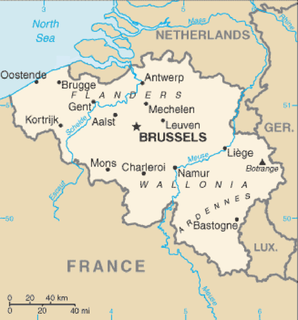 Belgium, officially the Kingdom of Belgium, is a country in Western Europe. It is bordered by the Netherlands to the north, Germany to the east, Luxembourg to the southeast, France to the southwest, and the North Sea to the northwest. It covers an area of 30,688 square kilometres (11,849 sq mi) and has a population of more than 11.4 million. The capital and largest city is Brussels; other major cities are Antwerp, Ghent, Charleroi and Liège. The municipality consists of the following sub-municipalities: Bütgenbach proper and Elsenborn. It lends its name to a nearby artificial lake. A deelgemeente or section de commune (French) is a subdivision of a municipality in Belgium and, until March 2014, in the Netherlands as well. Lake Bütgenbach is an artificial lake created by the damming of the Warche river in 1932. It is located near the village of Bütgenbach in Ardennes, Belgium. The lake is not far from the border of Germany. Zwevegem is a municipality located in the Belgian province of West Flanders. The municipality comprises the towns of Heestert, Moen, Otegem, Sint-Denijs and Zwevegem. On January 1, 2019, Zwevegem had a total population of 24,648. The total area is 63.24 km² which gives a population density of 380 inhabitants per km². Houthulst is a municipality located in the Belgian province of West Flanders. The municipality comprises the towns of Houthulst proper, Jonkershove, Klerken and Merkem. On January 1, 2006, Houthulst had a total population of 9,051. The total area is 55.89 km² which gives a population density of 162 inhabitants per km². Hooglede is a municipality located in the Belgian province of West Flanders. The municipality comprises the towns of Gits and Hooglede proper. On January 1, 2006, Hooglede had a total population of 9,831. The total area is 37.84 km² which gives a population density of 260 inhabitants per km². Langemark-Poelkapelle is a municipality located in the Belgian province of West Flanders. Mesen is a city located in the Belgian province of West Flanders. On January 1, 2006, Mesen had a total population of 988. The total area is 3.58 km² which gives a population density of 276 inhabitants per km². Schelle is a municipality located in the Belgian province of Antwerp. The municipality only comprises the town of Schelle proper. On January 1, 2006, Schelle had a total population of 7,806. The total area is 7.80 km² which gives a population density of 1,001 inhabitants per km². Meise is a municipality located in the Belgian province of Flemish Brabant. The municipality comprises the towns of Meise proper and Wolvertem, and, several smaller villages like Sint-Brixius-Rode, Oppem, Meusegem, Impde/Imde, Rossem, Westrode and quarters as Bouchout, Nerom and Slozen. As of January 1, 2006, Meise had a total population of 18,464. The total area is 34.82 km² which gives a population density of 530 inhabitants per km². Bassenge is a Belgian municipality located in the Walloon province of Liège. On January 1, 2006, Bassenge had a total population of 8,335. The total area is 38.17 km² which gives a population density of 218 inhabitants per km². Amel is a Belgian municipality in the Walloon province of Liège, and is part of the German-speaking Community of Belgium. On January 1, 2013, the municipality of Amel had a total population of 5,466. The total area is 125.15 km² which gives a population density of 44 inhabitants per km². Büllingen is a largely German-speaking municipality located in the Belgian province of Liège. On January 1, 2006, Büllingen had a total population of 5,385. The total area is 150.49 km² which gives a population density of 36 inhabitants per km². Burg-Reuland is a municipality located in the Belgian province of Liège. The name of the municipality refers to the castle "Burg-Reuland", which is located in the center of the community. On January 1, 2006, Burg-Reuland had a total population of 3,903. The total area is 108.96 km² which gives a population density of 36 inhabitants per km². Burg-Reuland is one of the municipalities of the German-speaking Community of Belgium. Lontzen is a municipality located in the Belgian province of Liège. On January 1, 2006 Lontzen had a total population of 5,071. The total area is 28.73 km² which gives a population density of 177 inhabitants per km². Plombières is a Walloon municipality located in the Belgian province of Liège. On January 1, 2006, Plombières had a total population of 9,672. The total area is 53.17 km² which gives a population density of 182 inhabitants per km². 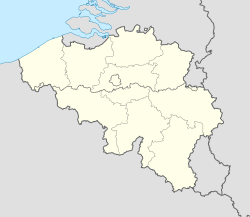 Raeren is a municipality located in the Belgian province of Liège. It was part of Germany until the First World War, after which it became part of Belgium. It is one of several towns in Eastern Belgium which still predominantly speak German. St. Vith is a municipality located in the Belgian province of Liège, and in the German speaking Community of Belgium. It was named after Saint Vitus. Waimes is a Walloon municipality located in the province of Liège, in Belgium. On January 1, 2006, Waimes had a total population of 6,728. The total area is 96.93 km² which gives a population density of 69 inhabitants per km².